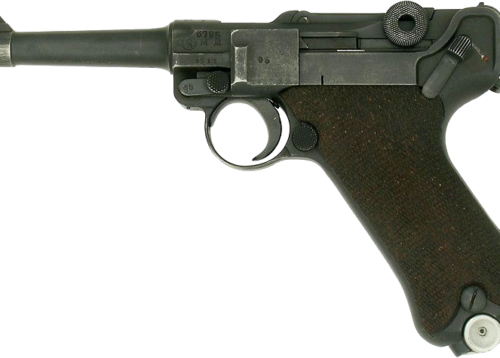 The Luger PO8 9mmP is one of the first semi-automatic pistols, the Luger was designed to use a toggle-lock action. 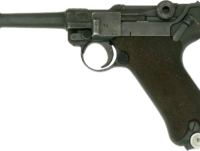 It uses a jointed arm to lock instead of the slide actions of almost every other semi-automatic pistol. After a round is fired, the barrel and toggle assembly (both locked together at this point) travel rearward due to recoil. After moving roughly 13 mm rearward, the toggle strikes a cam built into the frame, causing the knee joint to hinge and the toggle and breech assembly to unlock. At this point, the barrel impacts the frame and stops its rearward movement, but the toggle assembly continues moving (bending the knee joint) due to momentum, extracting the spent casing from the chamber and ejecting it. The toggle and breech assembly subsequently travel forward under spring tension and the next round from the magazine is loaded into the chamber. The entire sequence occurs in a fraction of a second. This mechanism works well for higher-pressure cartridges, but cartridges loaded to a lower pressure can cause the pistol to malfunction because they do not generate enough recoil to work the action fully. This results in either the breech block not clearing the top cartridge of the magazine, or becoming jammed open on the cartridge’s base.